The Mega-hug was born out of love and care for a loved one – my mom! My darling mom needed warmth and company during her time in Grahamstown Hospice after her stroke, which had paralysed her left side. When I found the fabulous new fabric called coral fleece, I realised that all I needed to do was come up with a simple design for a shoulder wrap that would easily settle around her, whilst still allowing her to manage it on her own - with one hand! It worked. It would keep her warm yet left her lower arms clear to move freely for any chosen activity or to open easily when too hot. The resulting wrap proved a winner. The comfort, warmth and “company” it gave were incredibly gratifying. Yay! I was soon making the wraps for family and friends for all sorts of reasons and sewing my hugs into each cuddly fleece. I was having such fun! They proved to be the best gifts ever! I gave each wrap with a gift-tag proclaiming that my arms were wrapped around them in the folds of the fleece and that I was close in spirit whenever the shrug was wrapped around them - together with a personal hug! It was amazing - all recipients loved the intent with which it was given and wanted to give the same to their own loved ones. I began to wish I could extend the gesture to anyone who would appreciate such a tactile gesture of care. There were so many people; so many victims of their circumstances who needed hugs...... But how? That possibility became a reality after my friend, Marilyn’s mom received one of my wraps after she started chemo-therapy and felt so cold. - she wanted a gift tag stating that her arms would be wrapped around her chosen recipient. It was her suggestion that made me sit down to design a logo that would depict a rounded mother-being who held her arms out in an embrace. My sister, Karry came up with the name “Mega-hug” (go figure!) and my hubby, John put together and registered the final finished logo. A business plan and beautiful dream have evolved. With generous input from friends, family and folk who have been touched by a “Mega-hug” shoulder wrap, the Mega-hug brand is growing from strength to strength and I’m busy bedding down the many exciting new aspects that will turn it into a sustainable and viable social enterprise that can also “pay it forward” to those less fortunate. It is my dream to turn the Mega-hug into a universal gesture of appreciation and care; something infinitely comforting and cosy that people can easily turn to when they need to be wrapped in an unconditional and companionable hug. The thought that runs through me is: “the Mega-hug is the Mother of all Hugs, because it is the one hug that is always available, unconditional and never lets you go unless you choose to shrug it off”. 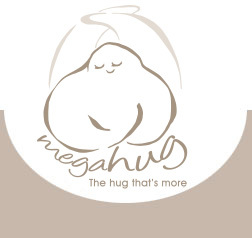 My dream of the Mega-hug becoming a gesture of care, dignity and sharing for all involved with or touched by the Mega-hug brand is coming true. experiencing the remarkable effect of the Mega-hug. Will there ever be enough hugs to go around?! As much as I wanted to create a means to deliver the joy of a comforting cuddle in a Mega-hug to all, I also dreamed of it becoming a means to provide work and dignity to local unemployed folk needing decent wages here in Cape Town – and this has indeed happened. I found seamstresses who needed work to help me sew the Mega-hugs and we’re growing into a work creation enterprise. The wages earned have saved a home from re-possession, have paid fees to allow children access to schools and crèches again and given the ladies dignity again. I also wanted to create the means of sharing Mega-hugs with those who have lost the care or support of their families & friends, yet still need the same comfort we are offering our own loved ones when we purchase their Mega-hugs. I can now offer a “Mega-hug Cares Package” to buyers of Mega-hugs. This package (two for the price of 1) allows buyers to “pay it forward” to strangers in need. When they buy a Mega-hug for a loved one, a Mega-hug Cares fleece wrap is placed in a collection basket for one of our chosen care-facilities which is duly handed over within a week of collection. My Mega-hugs can now be shared!